Silver supplies risk falling short of demand for some time to come. In mid-December 2017, I said silver would likely tack on steady double-digit gains before entering a “Tulip Mania”-style profit frenzy. Silver Production Won’t Ever Be as High Again; 2015 may well have marked a long-term peak in global silver production. Silver Mining Is a Tough Game… and Getting Tougher; According to recent research by SRSrocco Report, two of the world’s largest primary silver mines have been facing some very stiff headwinds. 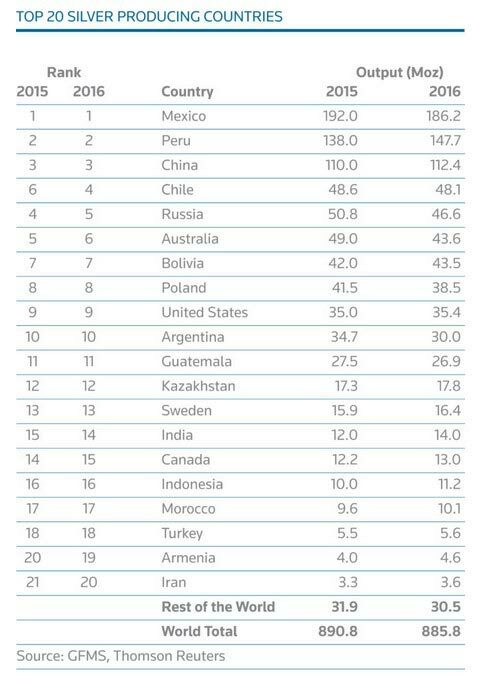 Silver Production Has Plummeted All Over the World; The following table (we only have numbers up to 2016 for now) ranks countries by annual silver output. The bottom line: Silver is in a massive bull market, and important production challenges will only add to the metal’s irresistible attractiveness and price gains in 2018.